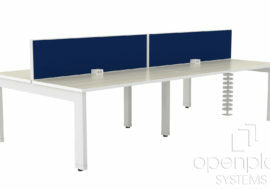 Out of all of Open Plan Systems’ products, the XPand System’s benching and adjustable height tables are the most modern and customizable options to date! 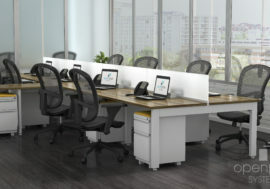 XPand benching and adjustable height tables offer all of the flexibility to create workstations that best suit your business: from interchangeable storage and accessory options to stations, which range from stationary workspaces to stations with adjustable heights. The XPand System falls under the All New Signature Program. The All New Signature Program features all new manufactured product, the largest selection of fabrics and finishes, customizable designer looks and no minimum or maximum purchase. Reach, our Benching option of our XPand System, brings the idea of an open workspace to the next level. Designed to foster a more open environment, Reach: Benching gives employees the freedom they need while simultaneously promoting a collaborative environment. XPand Reach: Benching work surfaces come in two configurations: Single and Double stations. Single stations range from 24″D – 36″D and 36″W – 84″W. Double stations range from 24″D – 30″D and 36″W – 84″W. 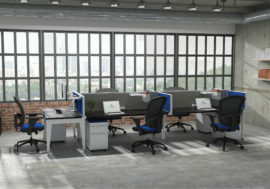 • Create countless combinations of workstations using customizable station sizes and return options. • Add screens to provide privacy without sacrificing space. • Mix and match your accessories and power options. • Complete your workstations by adding low storage. Who really wants to be in the same position for the entire workday? 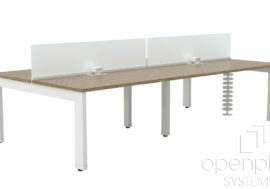 The XPand System’s Up: Adjustable Height Tables gives employees the freedom to shift postures throughout the day. With this system, you can shift from sitting to standing in a matter of seconds. The ease of this transition will help promote a healthier lifestyle among your employees, while boosting productivity and energy levels. XPand Up: Adj. Height Table work surfaces range from 30″D – 36″D and 48″W – 72″W. 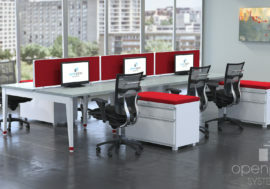 • Each desk includes a programmable control panel to set 4 preset height options. 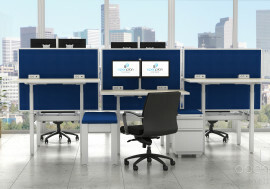 • Screens provide privacy whether you are sitting or standing. • Add a bench seat, accessories or low storage for additional comfort and accessibility. Our XPand System comes with several power options. This includes a single circuit 3-wire option that can be plugged into the wall or a four circuit, 8-wire power option that can be connected either in the floor or ceiling. • The power for your system is specified by choosing between a floor or ceiling option. • A power block can be used to join the in-feed to jumpers or to connect the jumpers together. In addition, outlets are connected to the power block. Each power block is supplied with six ports, two for power to pass through and four for duplex out connectors. • There are two options for tabletop duplexes. First, you can either plug in with a USB charging and two outlets or you can snap in 3-wire or 8-wire power sources. 8 Wire offers the 1,2,3 and 4 circuits and is available with or without USB charging capabilities. • Organize your power cables with our various accessories from cable trays, clips and wire management systems.